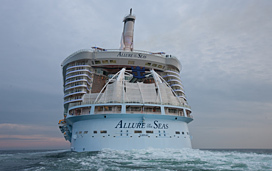 (1:15 p.m. EDT) -- A passenger who sailed on Royal Caribbean's Allure of the Seas during the world's biggest-ever charter for gay cruise travelers was sentenced to 21 months in prison for dealing drugs onboard. According to the Associated Press, the passenger, Steven Barry Krumholz, 51, of West Hollywood, Calif., pleaded guilty in July of dealing drugs onboard the February cruise. He had been arrested while the ship was docked in St. Thomas. Allure had been on a seven-night private charter with Atlantis Events, a travel company specializing in gay trips, both on land and at sea. The A.P. quotes U.S. District Court Judge Curtis Gomez, who said that Krumholz used his cabin "as if it was an apothecary for controlled substances." Krumholz was ratted out by a fellow passenger who reportedly was caught in possession of drugs by St. Thomas-based customs officers. Reports the AP: "Agents searched Krumholz's cabin and allegedly found more than 142 ecstasy pills, nearly 3 grams of methamphetamine, a small quantity of ketamine and about $51,000 in cash, the agent said. While waiting for the suspect to return to his cabin, two more passengers came to buy drugs, according to the affidavit." After the arrest in February, Royal Caribbean spokesman Cynthia Martinez told Cruise Critic that the line "maintains a strict zero tolerance policy regarding illegal drugs on its ships. We take various steps to prevent the transport of illegal narcotics, including working closely with U.S. Customs and Border Protection. Royal Caribbean cooperated fully with authorities during this investigation and will continue to provide law enforcement with any assistance they may need." Atlantis Events, which chartered the Allure of the Seas for the gay cruise, told Cruise Critic in a statement that guests "are fully advised of all policies and customs laws in advance of sailing. Atlantis fully supports Royal Caribbean's policies and works closely to enforce them."